“India is the most vegetarian friendly place on this planet” announced my sister during one of our skype encounters. Currently studying in the US, she was just back from a holiday in western Europe. This statement of hers had me wondering about my own stints abroad and I had to admit that although I had enjoyed eating a wide variety of good food, being a strict vegetarian without wanting to bend my rules it required much planning, efforts and energy from my end. This also had me wondering about how we take vegetarian food for granted in India. Go to any nook or corner of this country, travel north, south, east or west and it is so easy to find vegetarian food. From street food to exotic fare, on roadsides and in exquisite hotels, it is hard to miss this country™s proximity with vegetarianism. This vegetable preparation comes together quickly provided you have the ingredients on hand. I have noticed that it is quite easy to get intimidated with Indian food because of the long list of Ingredients. The upside is that once you buy the spices and the groceries, they stock well and last really long. Some spices can stay fresh for upto 2 years. 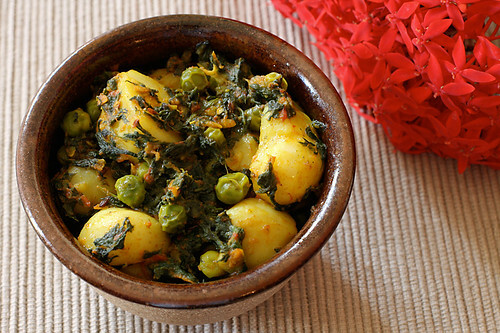 This Spinach, Potato and Pea side, cooked the east Indian way is a great means to add vegetables to a lunch, brunch or dinner menu. It perfectly complements most breads and rice dishes. My inlaws cook, Maya from Calcutta makes this dish and she says that you can substitute the potatoes with cauliflower and I suspect you could easily substitute the peas with corn. You can mix and match the vegetables here to suit your needs and tastes. Loved this recipe..sounds too good.. Wonderful clicks!! 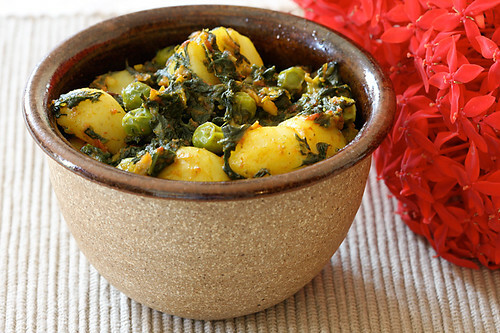 Love aloo palak. I have never used sugar. I guess it balances out the taste. will try it next time. Being a vegetarian, I appreciate this post. This looks incredibly tasty. Can't wait to give it a try. You said it! India is the haven for vegetarians. And what a mouth-watering recipe. Looks so very inviting in the earthen pot! You will love this recipe Preethi. Ruchi: Glad you enjoyed it. Thanks for the feedback. Hi Anu, i love to try new recipe but sometimes i cannot find some of the ingridents needed,like we don`t get fresh chillies only powdered ones and also coriander and ajwain can i use a subsitute.please let me know what sub i can use.thanks. simone: you can substitute fresh green chili with red chili powder or paprika, fresh coriander with dried coriander powder and ajwain with cumin or jeera. Though they are not accurate substitutes, they will serve the purpose.